SV Randall: Could you tell us a bit about your background. Where did you study? Zena Zekanyc: I grew up in Atlanta where I received my BFA in textiles at Georgia State University. I initially thought I wanted to be a fabric designer. After working in the rules of design, process, and product, I became more interested in relationships that existed between the mind and physical space. My installations dictate some action or altered point of view for the viewer. I had been experimenting with different materials, appreciating their qualities and dissolving their edges. Toward the end of that time I was exclusively making sculpture. I was also working in a gallery, at a radio station and doing visual merchandising. From there, I went on to receive my MFA from Virginia Commonwealth University. I felt it was difficult to explain my process as a non-traditional fiber artist. I found that the more questions asked of me, the better the answers I could find for others as well as myself. I am thankful to those faculty and my peers who pushed me forward in my practice. They forced me to be more honest in my making which I believe will give me a longer and more rich body of ideas to work from. Participating in residencies the last two years has continued to challenge my ways of making and my reasons to make. It is nice to be out of the academic bubble and experience a genuine connection to and reaction from people who are not trained in art but appreciate it. SVR: Your work engages heavily with specific materials. Can you tell us about your relationship with materiality? ZZ: Through my art process and material selection, I investigate how interior spaces long to accumulate memories and possessions. I am interested in encroaching floor to ceiling build-up of collected goods kept in the homes of individuals unable to discard or part with possessions. These individual’s daily movements through their space and their denial of the surrounding mass informs my work. My installations often begin with creating a wall or a floor that delineates itself from the actual architecture of a room. I collect domestic architectural materials that I process with a textile sensibility. By altering these materials, I assist in adding to their history. I consider the gathering of narratives surrounding the acquisition of materials to be part of the work. I seek out donated goods and trash piles, heaps on the edge of consumer waste. The sourcing of these materials is serendipitous. I elevate these mundane materials by taking them out of their original context. The cycle of regeneration moves from material to “art object” back to material again as the work is displayed and dispersed back into the cycle of waste. 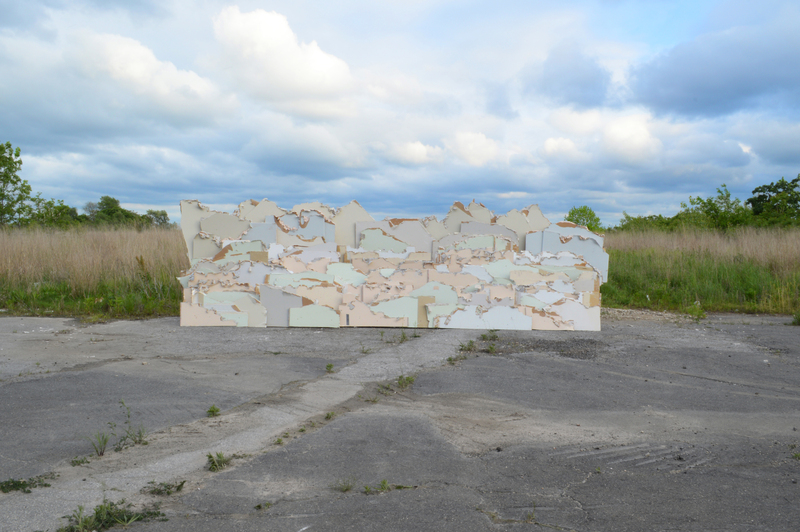 SVR: While a resident artist at RAIR in Philly – you completed a series of works on a monumental scale. Can you tell us how this residency impacted your works and what you were working on? Did you go into the residency with any specific plans? ZZ: RAIR was a perfect residency for me because of my love of collecting detritus and my inspiration derived from other people’s curious collections. RAIR is mostly construction and demolition waste, with the occasional house clean out. My original proposal was more community-based and I was thinking of ways to connect with the front end of where the material was coming from housing cleanouts to whole buildings being demolished. After speaking with Billy Dufala before my arrival I was committed to my activities on the site being the inspiration for my work. I work primarily in larger than human scale. My goal is always to create an immersive experience for the viewer. The work intends to take them out of the exhibition space and moment. The amount of material available or the space to be filled is a huge factor in the aesthetic of the work. RAIR has endless amounts of generic and unique materials. The availability of free material allowed me to focus on which things I was drawn to and why I wanted to collect them. When you first enter the yard, there is a recycling pile and a landfill pile. There is a drywall pile that is separated out before the hand sorting stage. I was instantly drawn to the layering of the pieces and how they were all from different sites but blended into one another, becoming nothing more than their material quality. I have always wanted to work with drywall as a material that delineated interior space from the exterior and rooms within a space. Domestic space becomes such a reflection of its owner. This relationship inevitably has ties to class and wealth. When one is confronted with drywall material without context, those signifers dissolve. It is all equally out of use and waiting to be transformed into a new product. The piece I made resembles a mountain range but functions as a visual barrier breaking up the flat land in which it was placed. SVR: One of the pieces I know you were working on included a large collection of tarps and sheet plastic sewn together – to create an enormous veil. Can you talk about this piece? ZZ: On the drive up to Philadelphia I was thinking of painters plastic and how much I could collect and sew together to make a giant quilt. When I arrived at the site and saw the landfill pile, I knew this was the site where the veil would be placed. The significance of the veil became a boundary between used material and discarded material. When the public discards material it so easily disappears out of their life but when discarding material or being confronted with that much material it becomes overwhelming. The veil softens the chaos of the yard and partially conceals the mass of the pile. The placement of the veil became very exciting. It was held up by two excavators which raised it up and then moved it over the pile. The wind became a factor rippling it to make waves and creating ocean like sounds. It was truly a beautiful installation process. SVR: Which is more important? The process of creating the piece, the piece itself or the documentation of the project? ZZ: All of my work is very process oriented, because the works are large and made of a lot of material they tend to take a long time to construct and resolve their structural issues. In this way, I would say the process of making is the most important factor for me. It allows me to work through ideas and meditate on my emotions or impulses. In this day I think the documentation of the work is more important than the physical piece because that is what will reach the widest audience over time. Lastly, letting go of the physical work of art is a inspiration for me to begin collecting new materials for the next piece. A great aspect of RAIR is that all the material to create the works of art are returned to the recycling pile to be made into something useable once more. SVR: Another piece you completed during your stay was the empty planter piece. Can you speak more about that piece? ZZ: The empty planters were one of the first set of objects I pulled from the recycling pile. I was immediately drawn to them as having a conversation with my thesis piece in graduate school. For my thesis project I collected clearance, dying or dead plants from the community. My dad would always go to Target and Lowe’s to buy plants that were marked down due to damage. He hoped that his care would give them life again. The marked down plants often had a less likely rate of survival and many died. He would keep the empty containers that filled our driveway, basement and back patio. At this phase, they were left to be recycled or continue to collect dirt and leaves outside. There is a vacant dock within the yard that is used for nothing because of its proximity to the sorting line and the waste it accumulates daily. This space collects dust more than any other exterior space because it has walls that block the dust from being blown away. As a continuation of my thesis piece, I collected empty planters which would collect dust and material even after my residency concluded. These empty planters seemed to have the same language as the ones in my dad’s yard. By remaining on the site, they eventually will be recycled. In the meantime, they are given one last chance of bearing witness to the labor of sorting in the yard. They collect the smallest particles of dust over time. SVR: What was the most impactful experience you had working at RAIR? ZZ: One of the most important experiences to me was a hoarder house that came in the form of five 40 yard dumpsters. I was only able to dig through one or two of these but they all seemed to have the same contents, mostly mail and trash, odd small collections, cards, etc. The only reason I knew any information about these dumpsters was the excited Tri-State driver who explained that we should look through every piece of mail because he had found money in an envelope. The whole yard suddenly became interested in these dumpsters. They were held to the side so I was able to spend more time searching through them. The weight of that experience was more powerful for me than any of the objects I collected. I felt removed from this person but because of my own personal narrative I felt that I understood the collections. I took away some pictures, slides, and letters to understand this person and their story. I remember when I couldn’t work in the yard I would sit down with the letters which were always dated. I would cry when I got to the last card in the collection. A child of the friend would write him to say the person had passed but they appreciate what a close friend he had been to them through all the years. SVR: After the residency, you had an exhibition at Atlanta Contemporary. Can you tell us about this work and what you were thinking while working on this project? At the time, I was collecting pictures off of Zillow, particularly of vacant homes. These were either for “sale by owner” or “pre-foreclosure:” steps, in the real estate world, that indicate a small death for the home. These images illustrate abandonment, lifelessness, and lack of use that at times breaks my heart or makes me laugh. This exhibition features a collection of images from homes that were in this phase in the metro Atlanta area in the month of August. The collection is viewed on a screen, the form that most individuals can choose to view death, heartbreak and joy, at a distance, daily. In the exhibition space, there are two accumulations. One, a tangled pile of the edge of carpet, cut away from a room it was too big for. The other, mismatched blinds that belonged to pairs or groups, that were discarded, collected and reintegrated together. SVR: Tell us a bit about how you spend your day? What is your studio like? ZZ: Currently my studio is very clean, lots of windows and plants. I work on little things, with fabric and found objects. Sewing has always been a primary process in my work. I also use forms of textile structure techniques such as basket weaving, twining or knotting. I find that the larger the studio or exhibition space, the larger my work will become to fill the space. Material processing is messy and when working on these more ambitious projects my space becomes chaotic. Like most artists I know there is a cookie crumb trail of ideas winding through my studio. This gives me inspiration to make when I am at a loss. It is a driving force for me to work through my ideas visually and not rely solely on materials or intuition to inspire me. SVR: How do you go about selecting titles for your work? ZZ: The scale of my work normally lends to a long process, where the words or phrases become present to me as I work on the piece. Sometimes I can think of a few titles at a time to use on pieces in the future. If I don’t write them down that moment, they are fleeting. Others are left untitled until after the work is finished. Words and phrases come easily to me and allude to an intimate relationship between people who are not actually present in the works. I like leaving this representation visually open. This choice makes the work feel open to a wider group of viewers through time. SVR: What artwork have you seen recently that has resonated with you? ZZ: One of my close friends, Steffen Sornpao, runs a gallery out of his basement in Atlanta called “Good Enough.” The mission of the gallery is to form networks with and to show contemporary works from artists outside of the city and open this connection to Atlanta artists who can be isolated by the geographical proximity to other cities. The other night I went there for the last show in that space. Sornpao was showing his most recent body of work: sculptures resembling idols comprised of welded and wired together, thrifted decorative metal objects that were meant to resemble hi-brow fixtures but have now been tossed away. The central idea is about appreciating non-physical deities such as the sun. He referred to the swirling patterns as representative of earth cycles. Other objects like birds, trees or heart lockets refer to entities that bear witness to but also are only existing due to the warmth and light of the sun. SVR: Is there anything new and exciting that you are working on that you would like to tell us about? ZZ: After completing graduate school my dream has been to create a non-profit that would assist in alleviating people of their possessions they no longer want or feel stuck with. In my research, some aspects of hoarding stem from a visual appreciation of seeing many objects of the same quality together, such as bottle caps or buttons. My work always has this visual quality of repeated pattern from my material choice. This avenue of art making can facilitate in the movement of such material. I recently obtained my real estate license to gain access to client’s domestic spaces. People who are in the process of moving are already mentally going through each of their possessions and why they are meaningful or worth keeping. It is easier to help people who are already in this mindset of parting with their possessions. In all my works once a piece is completed I would like for the material to be integrated back into the community to be used or recycled into new material. Zena Zakanycz is artists living and working in Atlanta, Georgia. She works with Habitat for Humanity, realtors, professional organizers and junk removal companies, to assist in the movement of material out of domestic spaces. In 2017 she was a resident at RAIR in Philadelphia and Black Iris in Richmond, VA. She has exhibited in Atlanta, Georgia at the Atlanta Contemporary Art Center, Swan Coach House Gallery, Beep Beep Gallery and FAB Gallery and Maury St. Warhouse in Richmond, Virginia. She studied textiles and sculpture at Georgia State University and received her MFA from Virginia Commonwealth University in 2016. SV Randall is an interdisciplinary artist working with sculpture, photography and installation to examine the relationship between consumer, commodity, and transformation. His work has been shown both nationally and internationally. SV is the recipient of the Toby Devin Lewis Fellowship Award, a Sculpture Fellowship through the Virginia Commission for the Arts, and a Visiting Artist Grant through the Institute for Electronic Arts. Since graduating from Alfred University in 2010, he has worked as an art handler, screen printer, art educator, and research assistant at the Metropolitan Museum of Art. 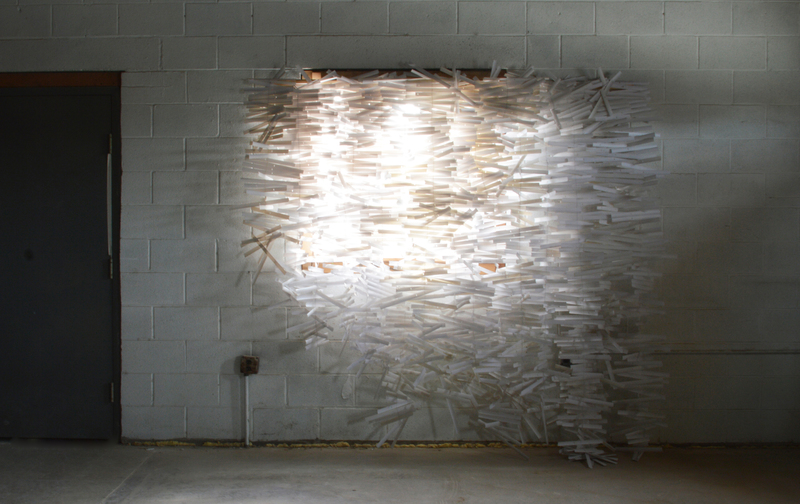 He recently received his MFA in Sculpture + Extended Media from Virginia Commonwealth University. He currently lives in New Mexico where he is teaching in the MFA and BFA programs at NMSU and UTEP as a visiting artist.